The Amish American McKinney Mission Trestle Table with 4 Self Storing Extensions is a wood table made for family dining. 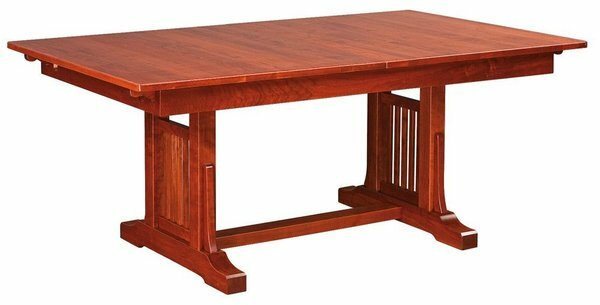 Solid wood elegance with convenience built right in, this trestle table offers more leg room than leg tables do. Mission style furniture never loses its edge and is often a choice for dining room centerpieces. Mission furniture is simple with no frills and looks elegant with its solid wood grain pattern on display. Self storing table extensions for the Craftsman means you don't have to make room to store them in a closet and they're right there when the table needs to be opened for a large gathering. If you've dreamed of having a new solid wood dining table built by hand, the Craftsman is a beautiful candidate. Amish made with premium quality materials. Please email or call us today with any questions. Thank you for shopping DutchCrafters for fine dining room furniture.